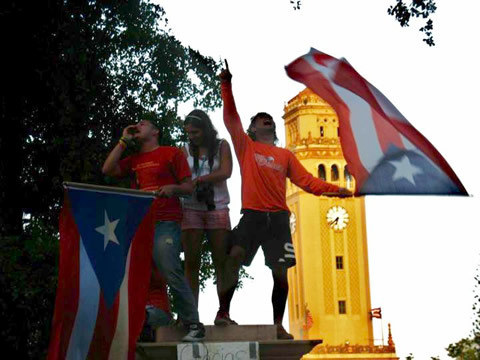 As the sun rose on Wednesday, April 21, 2010, two hundred students, mostly masked, some brandishing makeshift shields of wood and plastic traffic drums, approached the main vehicular access gate to the University of Puerto Rico’s historic Río Piedras campus, and chained it shut. Thus began the ongoing campus occupation, which has now spread to all 11 campuses of the UPR system, becoming the first ever system-wide public university strike in Puerto Rico. It is also the longest-lasting strike action of any kind in this U.S. island colony since the Río Piedras student strike of 2005 (which lasted 29 days). With no end in sight, the UPR strike of 2010 will soon boast the longest campus occupation in Puerto Rico’s history. The students’ three main demands are: repeal Certification 98, which opens the door to eliminating tuition waivers for honor students, athletes, and employees and their families; stop summer term tuition hikes; and fiscal transparency. 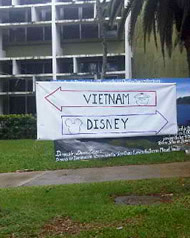 Río Piedras strikers have humorously dubbed their internal two-line struggle as “Vietnam and Disney”, with the front gates controlled by radical humanities and social science students as the former, and the gates at the back of the campus, controlled by more moderate law and natural science students, as the latter. The comparison apparently was overheard early on from a cop who had been assigned to both gates at different times. In terms of negotiations (the usual caveats about generalization and simplification apply): “Vietnam” sees the strike as part of a broader struggle for social change, and tends to favor a hardball approach, seeking concrete successes and guarantees upon which to build a long-term movement. “Disney”, on the other hand, tends to conceive the strike as a necessary evil in the search for a more just, inclusive coexistence with university authorities, and would rather secure the successes at hand over risking them by pushing for more. During the first two weeks of the strike, administrators refused to even recognize the legitimacy of the students’ 16-member Negotiating Committee (it includes representatives of “ base committees” from different campus colleges and constituencies), and later did so grudgingly and dragging their feet. All the while, a number of deans and administrative assistants have been provoking confrontations with students by entering the campus through the one gate that students have been unable to barricade, and which has remained under control of UPR Security. Students and professors have maintained a picket line, but constant police presence has precluded any hope of enforcing it effectively. Fortunately, scabbing by students and professors has been negligible. The Board of Trustees initially designated a five-member committee of its own to “study” the students’ demands. UPR President José Ramón de la Torre finally met the Negotiating Committee only after mediation by the Civil Rights Committee, a publicly-funded legal NGO, even though he had already publicly met with and congratulated the “ Silent Majority”, a small group of students opposed to the strike. This group later revealed, however, that although it opposed the strike, it held the administration responsible for resolving the situation by negotiating. No progress came until the Board of Trustees as a whole declared its intent to meet with the students. Several days of expectation, however, resulted in deadlock. As of this writing, Chancellor Ana Guadalupe has declared an administrative lockout of the Río Piedras campus until July 31, in response to a massive student assembly held last Thursday, May 13, which ratified the strike by near unanimity. That assembly was called by the Río Piedras Student Council in concert with the administration, outside the campus, on the administration’s terms, in hopes that students opposed to the strike, eager to graduate, or simply worn out by over three weeks of uncertainty and tension, would assist in droves and vote to end or at least temporarily suspend the strike. The plan backfired when the overwhelming majority of the more than 3,000 students in attendance voted to keep the strike going. Following their unexpected victory, the assembled students then marched to the Capitol building, to underscore the fact that the policies they are protesting respond to broader budget cuts that result from the current government’s neoliberal “austerity measures”. The notorious Law 7, which has authorized the sacking of tens of thousands of public employees, also removes several key sources from the UPR’s constitutionally-mandated funding, thereby draining resources even further. Other campuses have not held assemblies so far to determine the future of the strike. It is believed that other campuses largely depend on Río Piedras for momentum, due to the sheer size of its student body (18,000) and its history of militant struggle. However, it is undeniable that all of the campuses have developed their own leadership and particular demands in the course of this struggle. The Mayagüez and Humacao campuses, in addition to Río Piedras, have even created their own digital radio stations. The broad, sytstem-wide appeal of the strike movement was demonstrated on Friday, May 6, when thousands of students and supporters from all 11 campuses marched together to the Presidential Offices, where the Board of Trustees and the Rio Piedras Negotiating Committee were deliberating. Police blocked the entrance to the grounds, forcing protesters to form a massive picket in an important intersection in the middle of rush hour, partially holding up traffic for several hours. Following complaints by other campuses that they were being left out of the negotiation process, a National Coordinating Committee was formed, with representatives from every campus, which will now lead attempts to pull the administration back to the table. Negotiations between the UPR Board of Trustees and the Río Piedras Negotiating committee broke down when the administration rejected the students’ proposal to repeal Cert. 98. Instead, it submitted an alternate agreement that in theory made important concessions, but contained a poisonous clause that eliminated waivers for students receiving Federal Pell Grants. This possibly illegal and unconstitutional measure would brazenly discriminate against poorer students who receive federally-funded need-based aid, making them ineligible for merit-based waivers. A carefully orchestrated corporate media campaign then began, which proclaimed that the end of the strike was at hand and that the ball was now in the students’ court. The administration appears to have hoped the grant-waiver tradeoff, which would be unacceptable to “Vietnam”, would divide the Negotiating Committee, delegitimizing and isolating the radicals. That attempt proved a catastrophic failure when the striking students’ participative process of deliberation produced an overwhelming support for continuing the strike, encouraging “Disney” to close ranks. It was then that the Board of Trustees decided that the “democratic” thing to do was to put the question to the entire student body, spending several million dollars (despite the fiscal crisis that produced the very cuts students are protesting) on an off-campus venue and several newspaper adds that falsified preliminary understandings signed by student negotiators, passing them off as “agreements”. 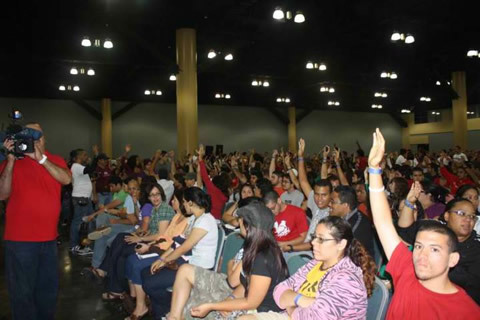 The historic May 13 assembly turned the tide in favor of the students once again. The following day, however, strikers and supporters had a rude awakening, as the notorious police riot squad cordoned off the perimeter of the one mile radius of the Río Piedras campus. A father attempting to pass food and water to his striking son inside the campus was beaten and arrested. Police Superintendent José Figueroa Sancha later confirmed that he had personally given the order to cut off food and water deliveries, and anyone with a problem should try the courts. The administration also announced it would request that water and electricity service to campus facilities be shut off as well. Later in the day, a physically disabled graduate student who had exited the campus momentarily was beaten unconscious, dragged into a squad car, and arrested. Police pepper-sprayed onlookers who attempted to aid him. The student was treated at a nearby clinic and released without charges late into the night. This re-escalation of repressive force, however, also resulted in a massive display of public support. The blockade of food and water, which the police has kept in effect despite a series of confusing court orders, was effectively broken early on when hundreds of supporters tossed bags of food and bottles of water over the fence and over the heads of police officers in front of the television cameras. This method of delivery has continued, with occasional scuffles, as police continue to deny free access. Thousands of people arrived at the scene throughout the day, with huge picket lines forming at gates located on opposite sides of the campus. 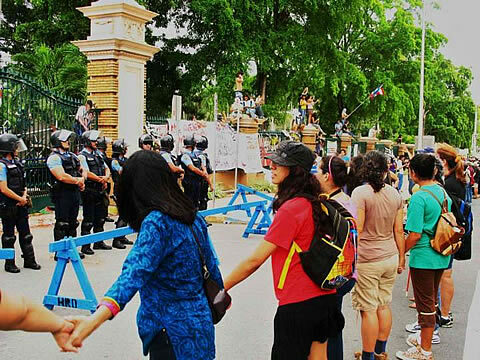 At one point in the afternoon, Ponce de León Avenue, which straddles the main entrance to the campus, was flooded with supporters, and had to be closed to traffic. At this point, the crowd became too large for police to control students entering the campus by simply jumping the fence. Demonstrations extended well into the night. The following day, public presence ebbed and flowed, with police heavy-handedness fluctuating likewise. At one point, a well-known doctor tried to enter the campus in order to treat students reporting high fevers, and was forcefully pushed back by police. Eventually, however, he was allowed access. The ebbing, tense situation is ongoing at the time of this writing. The newly constituted National Negotiating Committee has renewed overtures to the Board of Trustees, to no avail as of yet. Public solidarity and morale among students remains high, but at this point, the iron intransigence of the capitalist moguls pulling the strings of both the UPR administration and the government can only be broken by a massive people’s movement that brings the island to a standstill. A coalition of labor unions has called for a 24-hour labor stoppage next Tuesday, May 18, but it remains to be seen what they are willing and able to pull off. Many of these unions, grouped primarily in the U.S. internationals ALF-CIO and Change-to-Win, have lost much credibility and drawing power among their base as a result of past capitulations. Among other things, they have sided with past governments from both dominant parties (pro-statehood and pro-status quo) by supporting the notorious public service unionization law that bans strikes, a regressive and highly unpopular sales tax, and attempts to crush the militant, rank-and-file, independent teachers’ union. Many also believed they squandered the opportunity to build a mass movement against layoffs and privatizations after the “National Strike” of October 15 of last year. Meanwhile, more consistently militant or genuinely rank-and-file unions have yet to announce their plans. Some speculate the delay may be due more to sectarian squabbling than anything else, although it is fair to note that unlike the business model “internationals”, rank-and-file unions actually have to consult their base before taking crucial decisions. The struggle has thus entered a crucial stage that depends on ordinary workers’ and people’s capacity and willingness to act and flood the streets on May 18 and beyond, independently of their leadership. International displays of solidarity, whether financial or by way of action, is needed more than ever. I happened to be in San Juan, Puerto Rico last week and I took some pictures of art student resistance at UPRRP. Just click here.